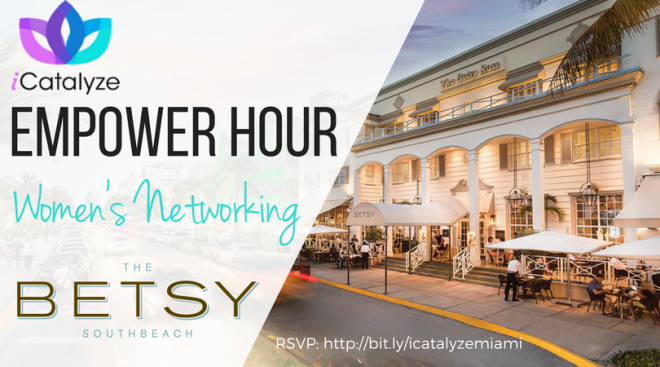 iCatalyze's first meetup: Women's Networking in Miami - iCatalyze - Seeks to catalyze your potential! We’re excited to share the news that we will be holding our first in-person meetup in Miami on May 22nd from 6 to 9 pm at The Betsy Hotel. Join us for an empowering Happy Hour which will bring together professional women and entrepreneurs who want to expand their leadership skills to advance their career or business. This networking happy hour is for you if you want to empower yourself and strengthen your leadership skills to become a better version of yourself, while making meaningful connections with other dynamic women. This will be an intimate event with opportunities for bonding and growth, and it is only the beginning! The event will be hosted by Diane Garza, CEO and Founder of iCatalyze Leadership Development and Coaching, who is an executive coach and leadership instructor. She worked at Georgetown University in Washington D.C. for 8 years designing and facilitating leadership programs for young leaders and executives from the public, private and social sectors.